The third beta of iOS 5 arrived yesterday, and one of the latest additions from Apple (s aapl) is support for gestures that can replace various button functions and help navigate the user interface. Mac Rumors notes that the new Assistive Touch option is found under the Accessibility settings; once turned on, a floating button stays on the touchscreen for gesture use. While Assistive Touch appears targeted for those that are physically unable to use hardware buttons, it could signal that future iOS hardware has fewer buttons or loses the Home button altogether. The gesture features aren’t yet fully baked in this beta version, but that’s to be expected and is, after all, the definition of a beta. For example, while you can save a custom gesture, there’s no way to assign an action to it. Other features do work, however, in a hierarchical menu system. The main overlay offers four options: Home, Favorites, Gestures and Device. Home does the obvious and returns you to the home screen. In Favorites, there is both a Pinch and Swipe gesture, along with any saved, custom gestures. Gestures is interesting, as it shows four options: Hands with different numbers of fingers showing (two through five), indicating how many points of touch to use for a gesture. This indicates that multi-touch navigation could move beyond just one or two fingers in iOS. 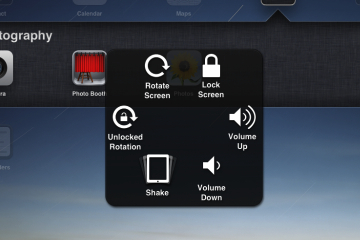 The Device menu offers more controls: Lock Screen, Volume Up and Down, Shake and Rotate Screen. Returning from any of these menus back to the main Assistive Touch menu is a simple pinch action. Assistive Touch is certainly geared to tackle accessibility issues for those that have them, and the features aren’t yet optimized or polished. So there’s no guarantee that iOS devices will lose some or all of their hardware buttons in the future. After all, some of those buttons have become multi-purpose switches; the mute button on the iPad that eventually doubled as a screen rotation lock lever comes to mind. But the Assistive Touch gestures do show that Apple could opt for no physical buttons, such as the relatively large Home button. That would allow for either a smaller, cheaper iPhone; a handset with a slightly larger display; or perhaps some combination of both. On a smaller screen, however, multi-touch gestures can get cumbersome. Do you want to see a buttonless iPhone or iPod touch, or do you think this approach is best suited for the 9.7-inch display of an iPad? I’ve a developer through apple, if you’re intersted in getting iOS 5 Beta. Check out my page. I doubt I could use a five-finger gesture on an iPhone. iPad maybe. Saying that, I doubt many people could remember a great number of finger gestures anyway. I think its just a gimmick that apples trying to add on to make it look special. The gestures are not necessary to move around all that much faster. If Apple was to improve anything it would actually be putting more buttons in. “If Apple was to improve anything it would actually be putting more buttons in.” That’s an interesting thought: what buttons should be added? Personally, I do not think getting rid of the home button is at all intuitive. How would I be able to do a hard restart of my iPhone if it plays up? How will DFU Mode be accomplished without a physical home button? The only reason I jailbreak is for Sbsettings. I’m really looking forward to iOS 5, especially with the custom gestures, and also hope that there is some alternative to the home button double-tap before mine fail. I’ve had my hands on Lion for a while now and am very fond of using gestures in it and to have a consistent set of gestures that work on all my devices should really simplify things. Makes sense considering multi-tasking has just about torn up my home button on my iPhone 4. I doubt it could survive several years of use as Apple intended. The double-tap has been killing other people’s home button too. Numerous friends have had their devices replaced with the home button not responding.